I recently installed a step up transformer to convert our 3Ø - 120/208V service to a 3Ø - 277/480V. It works like a charm, our service at the shop runs a little 'hot' ... typically 126/215V. I can adjust the taps on the transformer primary up to that and out comes perfect 277/480V. However... I just acquired an older Solberga drill that I want to power up. The nameplate says 3Ø - 440V. Our transformer, set on it's highest primary taps, still leaves us with ~271V-275V on each phase/leg and roughly 471V-475V phase-to-phase. What is the most practical way to lower the voltage to ~440V? Buck and boost? If so, do I need 3ea single phase buck and boost? 475V vs 440V = 108%. The motor will have slightly less efficiency and therefore run hotter, it will also start with higher inrush current and higher starting torque which can have an effect on couplings, bearings etc. The motor will have less efficiency and therefore run hotter, it will also start harder which can have an effect on couplings, bearings etc. What would be the proper way to lower the voltage to 440? I wouldn't bother to be honest, but the "proper" way would be buck-boost transformers, 3 of them. Ok. Any suggestions on make and model? Be honest with me. You will hear crickets because no one else supports anything but "plug it in".... Do it! There is not a concern here! Ok. Going to give it a go later today. 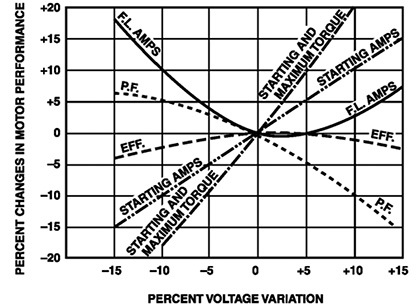 If you want to go the buck/boost transformer route, you will need to get the full load current of the motor. The size of the transformer (3) is the full load current times the voltage reduction. Do a google search for buck/boost transformers. SqD has a nice procedure for choosing the correct transformer. 1) More often then not you'll buck/boost with 2 transformers not 3. (100% of my experience has been 2) Looking at my charts, the only good option I see is bucking 480-436V delta connected using 2 transformers. There's another route using the same transformers connected differently that will give you 480-457. That setup hardly seems worth it. This info is out of HSA literature. Note that the ones mentioned are of the 24/48 type. 2) Seeing as you're working with a smallish motor and the transformers have to handle only a small fraction of the full load current, your transformers will be tiny. Meaning inexpensive. All this info is in most buck/boost selection literature. HeviDuty and HPS are a couple you can Google. But likely you'll be fine as is. Typically you don't run a drill press continuously or even repeatedly, meaning the duty cycle on that motor is likely to be low, again lending to the added heat risks being low as well. That makes sense. If I did go with buck/boost, is it important to have the buck/boost transformers sized exactly for the load? Or could I have three or four times the kva/amperage that I will be drawing from this machine? That way I have 'room to grow'... I am uncertain if buck/boost works like that. Thanks 13engines. I was looking at the FederalPacific buck/boost online calculator and came up with pretty similiar results. My transformer output is 277/480, which I have manipulated as low as 269/471 using the taps. If I choose a buck boost with 277/480 input I would use three transformers, according to the FP website. If I choose open delta, then it requires only two transformers. Can I use two buck/boost wired for open delta feed with a wye input? That makes my head hurt! lol. Thanks again. Using your online calculator I get the same results as mentioned above. 480-436 using two transformers. As far as the Delta Wye thing. I neither completely understand that stuff or care to. It doesn't matter. You got three wires going in and three going out. That has proven good enough in all the buck/boost playing around I've done. Pick a reduction that matches what you're after as close as possible, follow the wiring diagram (in this case diagram "G") and wire to suit. Don't let the diagram scare you. Once you get it all in front of you and start connecting, you be surprised at how simple it is. It's about the same difficulty as wiring in a 3-way light switch. Size to suit. Over-sizing just wastes money. Oversizing on KVA is harmless. A small increase in core loss. May not even be measurable without sensitive instruments. As far as the Delta Wye thing. I neither completely understand that stuff or care to. It doesn't matter. You got three wires going in and three going out. That has proven good enough in all the buck/boost playing around I've done. Yeah, it hurts my head trying to understand how wye and delta really work, pretty sure it's magic. I have no doubt that it will work as you describe... I just want to make sure it's safe. If I take three 'hot legs' from the 277/480 service and run them through two buck/boost transformers in an open delta configuration... is there a floating ground? Floating ground eh? Again you're running slightly into my grey areas, and I don't mean the hair on my head, but the stuff inside of it. There is no ground "wire" connection inside these transformers. There will be a case grounding lug in each can that I've always attached to the same ground going to the machine. I think when you start getting into floating grounds and the likes, you're starting to involve a common. (I could be wrong here.) There are typically no commons entering 3 phase equipment. Derived therein perhaps, but not with the incoming. Attached is a picture that's representative of what you'll see in about any buck/boost trans. Four heavy lugs and 4 smaller wires or lugs. This is a 3KVA unit so things are going to be bigger then what you'll see for your drill press. You'll short some lugs as well as some wires. That "G" wiring configuration is one I'm familiar with. Mount the cans right next to each other with either a direct coupling or a short length of EMT or similar. The wires are usually long enough that you can pass them through to each transformer as needed for the proper connections. I usually take the one main wire that for all practical purposes passes straight through, and just strip a small section of of the sheathing and clamp the two small H4's to that. The rest of the leads you generally have to cut and terminate inside the cans. Get some of that stretchy, mold-able rubber tape to wrap things up with. I think that drill press is big enough and the transformers you'll end up using small enough, that you'll be able to mount them right to the drill press. They make no noise to speak of. LOL. Thanks! This is all super helpful information.